"I just wanted to thank all of the palapas ventana staff for an amazing spear fishing trip. From the time we got there to the time we left we were treated so well and it made it a no brainer for our next trip to be with you guys. Great rooms, pangas, boat captains,shuttle service, cooks, maids, bar tenders, and doggies. You guys run a good business and will be referred time and time again. Thank you for making it possible for us to do the trip, it is one we will never forget. Hope to see you in the near future." "Having been able to travel and dive at many locations around the World, I have narrowed my favorite destination to a little piece of Heaven in Baja called Palapas Ventana. This dream in the making is owned and run very capably by Tim Hatler and his family and once you arrive, your needs are met to whatever degree you wish. While most destinations insist and fail at fitting you into their agenda, the staff of Palapas Ventana and people of La Ventana do nothing more than smile and invite you to join in their celebration of the area. The activities are varied and numerous with contingencies and options for weather, interests and abilities. For those wishing to test their skills in the deep blue around Isle Cerralvo, for those wanting to hike in the foothills, for those wanting nothing more than a clean, warm patch of sand to lay on free of cell phones, there is no finer option than Palapas Ventana. Tim and Co.'s enthusiasm is infectious and once you jump in, you are forever spoiled for the quality and fun presented to you in any degree you seek. And once you return from your adventure from the deep Ocean or the amazing waterfalls, from an adjoining beach or walk along the busy Malecon of nearby LaPaz, you're met with clean and comfortable amenities and food prepared to your wishes. At night the stars battle for rights with the moonlight on the Sea of Cortez. Your comfort and interests are foremost in the minds of the staff without being pushy, your needs addressed without hesitation and your enjoyment is yours to seek. I cannot emphasize to the prospective traveler enough the ease at which you will feel at home here while also feeling very, very far from your day to day stresses. Kudos to Palapas Ventana and I will regresso pronto." 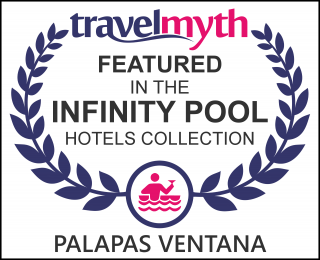 "We have been to Palapas Ventana the past three years. We go down there to chase the wind. It's a great kiteboarding spot. Never have had to think twice about staying there. We love the fact that it is ran by a mother & son. They & the staff go out of thier way to make you feel welcome. It's an extra bonus to have breakfast & lunch included with your stay. The meals are authentic home cooking. In my book you can't get better than that.. We already have plans on going back down to the Palapas this upcoming fall. A++++++!" "I stayed here for a week and had a great time. Food was great and so was the hospitality shown by Tim the owner and his family. The place has a very laid back vibe and an intimate knowledge of the local waters for fishing , diving, snorkeling, and whale watching. Palapas Ventanas dive operation was also very good. They have current gear and their dive masters are very familiar with the wonderful local dive spots. We were in the water with tuna, sea lions , whales , and dolphins to name a few. My room was located about 150 yards from the beach. It was basic yet nice and the linens were very clean. The land scape was native desert flora and blocked the sight of the road and its few cars. Everyday from my porch I awoke to the sun rising over the gulf. My travel partners stayed in the upgraded palapas that I would highly recomend if you are travelling with a significant other. They have their own private bathrooms and are even closer to the beach. The restaurant was fun and we even organized a ping pong tournament for a night while we were there. I would recomend this hotel to travelers who would like to have a wonderfully unique experience on the Gulf side of Baja." "We stayed in beachside Bungalows that were cozy and comfortable with a hammock on the porch a small fridge and AC. The best part was the meals and of course the diving as they took us daily to the island just offshore to explore. The staff was very friendly and made us feel like we part of the family--even the dogs on site were wonderful and made it like home--well be back!!" "Palapas Ventana was a treat for my whole family! The kids loved snorkeling and an early morning kayak paddle. My wife loved the warm water snorkel at Punta Arena, by the old hotel. And I loved the fishing, kiting, and stand up paddle workouts on the beautiful flat water. The Palapas were cozy, clean and comfortable... every detail made this trip super fun for everyone. Thanks Tim, we're definately coming back again next year! "